Born in Santa Fee (Argentinia) the young NURY GUARNASCHELLY is one of the most beloved french horn player of our times. She was 1st solo horn player at the Gustav Mahler Chamber Orchstra under the direction of Claudio Abbado and was asked afterwards to play in many different well known orchestras like the Berlin Philharmonic Orchestra, the Orchestra of the Deutsche Oper Berlin and many more. For more than 16 years she was engaged as 1st solo horn player at the Radio Symphony Orchestra in Vienna. 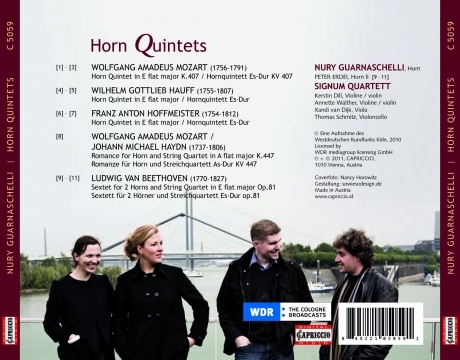 With this CD she presents not only the famous chamber music for horn of the Mozart-Time but she also shows us her sensitive and virtuoso playing beside the big Horn Concertos of the 20th century, she once recorded at Phoenix Edition Label (PE131). For this recording she is accompagnied by the successful young talented SIGNUM QUARTET, one of the most interesting new String Quartets of the last years. 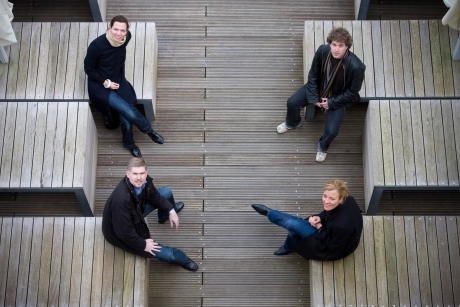 Their Debut-Album with string quartets from Joseph Thuille (Capriccio CD C5049) was very enthusiastic critizised and was awarded with the „Pizziccato“ Music Prize for best recordings.